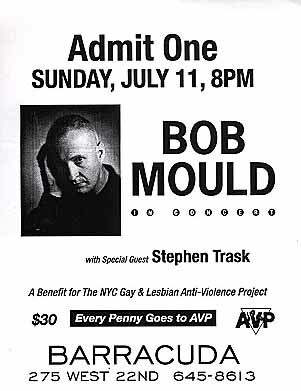 In July 1999 Bob gave a performance to benefit the NYC Gay & Lesbian Anti-Violence Project. Tickets went quickly at the face value of $30, many of which Bob sold personally at a record store in NY. The eight tickets he put up for auction on eBay went for an average of about $170 apiece.